If you have teenagers like I do, then all you have to do is mention the word “pizza” and they are all ears. There’s something strangely magical about pizza that attracts kids, especially the hungry teenage boy types. I decided to try something a little different and experimented on those boys. Luckily, the test was a success. I think the only thing missing was dipping sauce. These were fabulous on their own, and a really great warm and hand held snack, but dipping sauce would have pushed them over the edge. 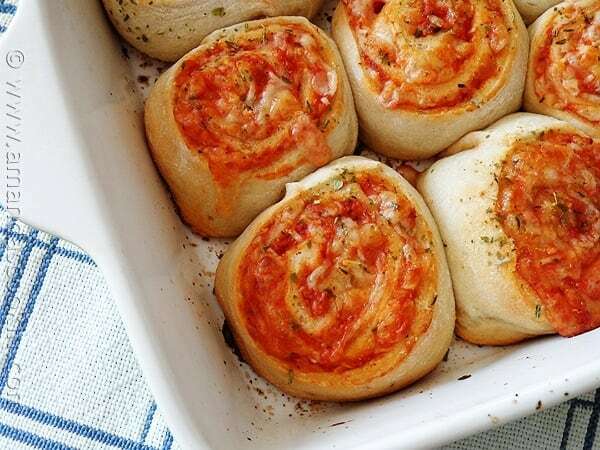 I wanted to try them first as a cheese-only type roll, but they would be great with some pepperoni or sausage, or any other pizza toppings you normally partake in. 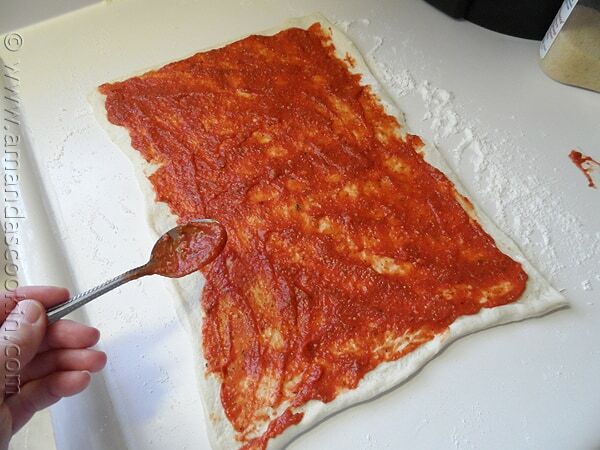 I make my own pizza sauce (recipe here), so having extra for dipping does not present a problem. 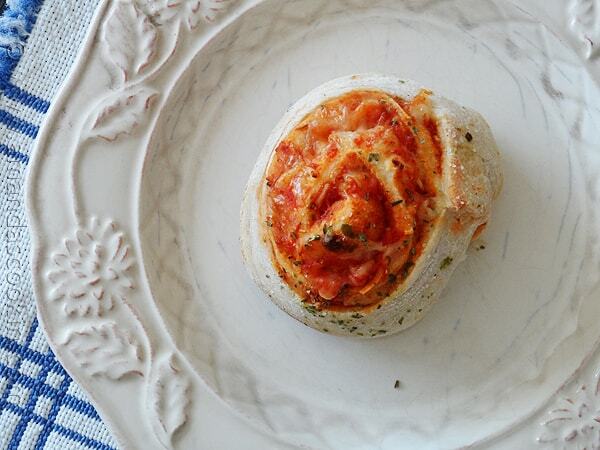 If you buy jar sauce, you should be fine too as the rolls themselves only need 1/2 cup. These are great for after school, when friends come over, watching the game or just for hanging out. 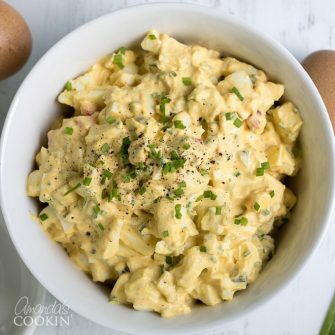 The best part is that you can teach them how to make these themselves, or make them ahead and having them waiting in the fridge, ready to pop in the oven! These aren’t hard at all. 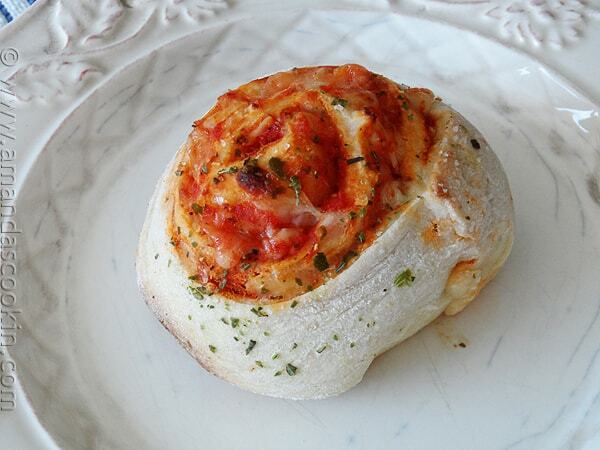 Start with a can of refrigerated pizza dough. 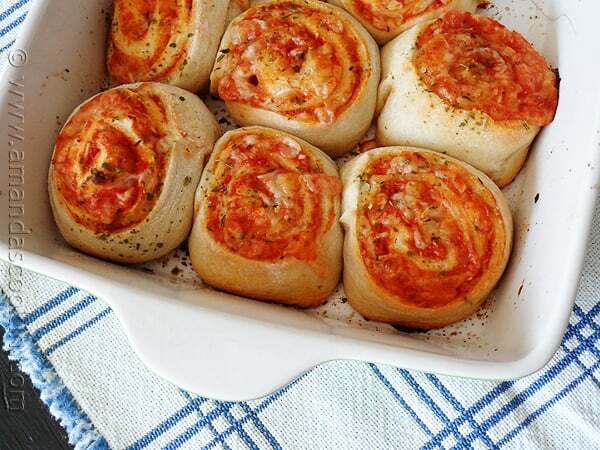 Spread it out and cover it with the pizza sauce. Cover that with the Mozzarella cheese and then with the Parmesan cheese. Starting from the long end, roll up dough and wrap in parchment. Place in freezer for 15 minutes to chill. Meanwhile, melt the butter in a small bowl. 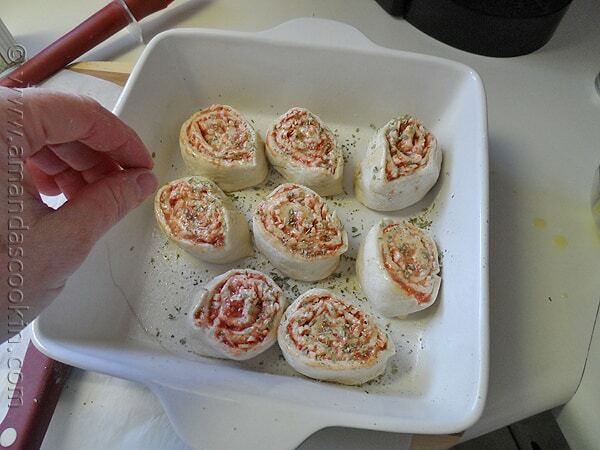 Remove dough log from freezer and slice into 1 1/2″ discs. Place in prepared pan, slice side up. Preheat oven to 400 degrees F. Spray a 9x9 square baking pan with cooking spray. Lightly flour work surface and remove pizza dough from can. 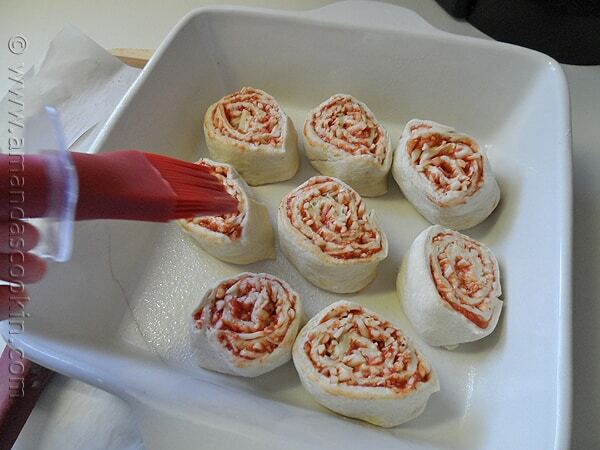 Unroll to a rectangle and spread with pizza sauce. 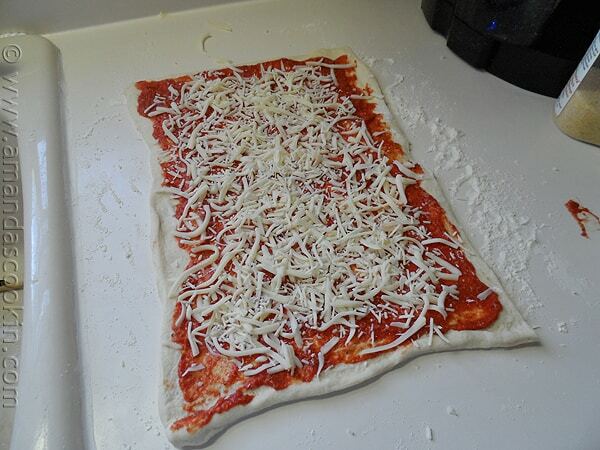 Sprinkle with Mozzarella cheese and then with the Parmesan cheese. Starting from the long end, roll up dough and wrap in parchment. Place in freezer for 15 minutes to chill. Meanwhile, melt the butter in a small bowl. 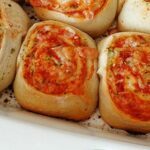 Remove dough log from freezer and slice into 1 1/2? discs. Place in prepared pan, slice side up. Brush tops with melted butter, then season lightly with garlic salt and sprinkle with Italian seasoning. 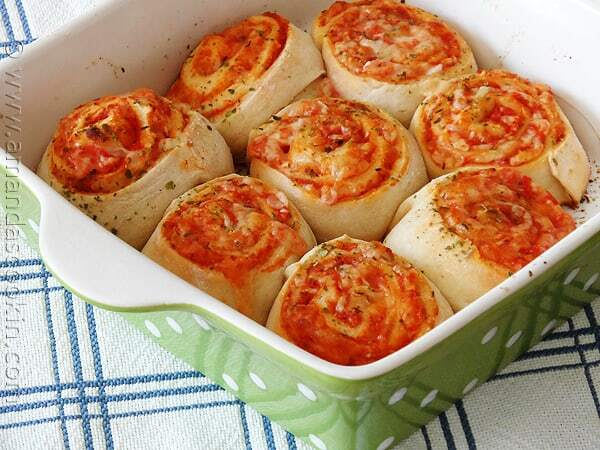 Place in oven and bake 22-27 minutes. 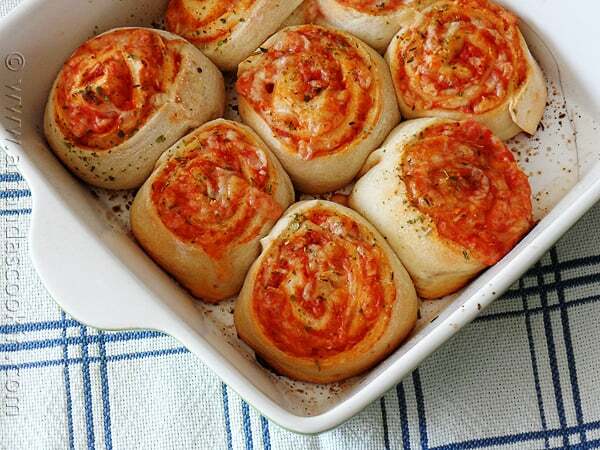 Rolls are done when crust is lightly browned and cheese and sauce are bubbly. Do not roll from the long end. Roll from the short end so they stay together!! Yup! Just made some and they look like flat rolled pancakes ?? Oh no! I’m sorry they didn’t work out for you. Without being there I’m not sure what might have happened. I’d be happy to help troubleshoot with you if you can give me a little more detail. Being from NYC, pizza is one of my weaknesses. We had some friends from church over a couple of weeks ago. I made these, but a somewhat mini version, and served them as appetizers. The only thing different, besides smaller portions, I diced up some thin sliced pepperoni and sprinkled that on top of the cheese; then rolled them up, brushed them with olive oil then sprinkled them with seasoned salt and Italian herbs. Next time I’ll know to make bigger batches, especially with kids; you step on their feet and their mouths open.